DC Comics path towards a female-friendly image has been rocky to say the least — but it’s taken some great steps forward with the surge of popularity in comics like Batgirl and Gotham Academy. Now they want to take it a little further with a new initiative that highlights their female heroes. Only three Batman-related characters? Such restraint! But still, it’s nice to see heroes like Katana and Bumblebee among the usual cast of heavy hitters like Wonder Woman, Supergirl and Batgirl. It’s also nice to see the big comics companies starting to acknowledge the growing base of female comics readers. 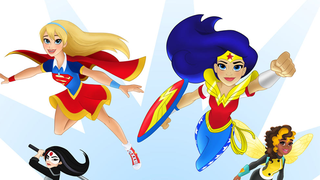 Let’s hope DC Super Hero Girls offers a neat entry point into the world of comic books for new audiences.